My mom is a great cook. She shies away from that compliment most of the time, especially when I say it. I guess because I went to culinary school and she might feel that I know more than she does. However, I think she forgets that I learned to cook mostly from her. 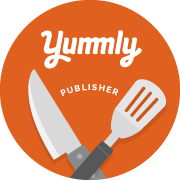 She didn’t make the fanciest of recipes, but they were made with great plans and with a lot of love, not to mention, they were also very good. Just about every meal I can remember while growing up was a sit down meal – table set with plates, napkins, forks and knives, and glasses filled with iced tea. The meal usually consisted of a main dish, salad, fruit salad, other vegetable and rice, noodles or potatoes. In most people’s minds today, it was a big spread. 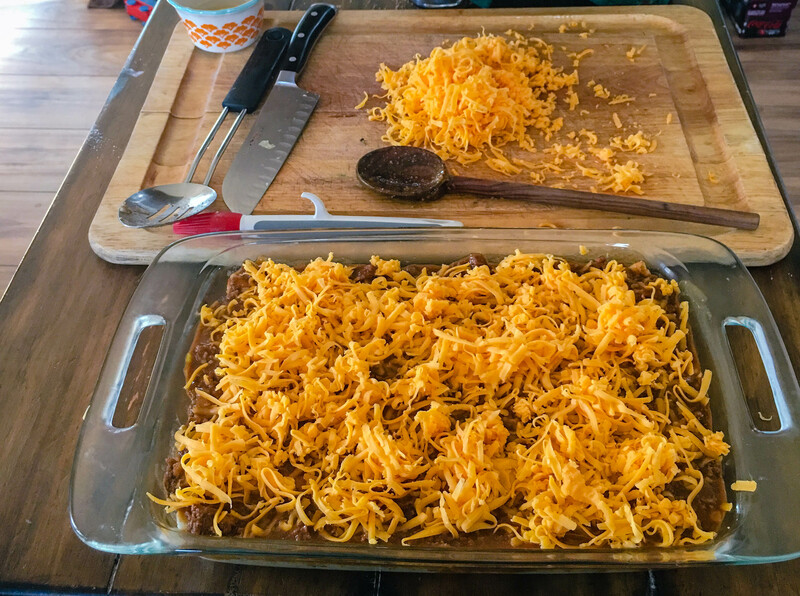 One of June and I’s favorite meals were mom’s enchiladas. 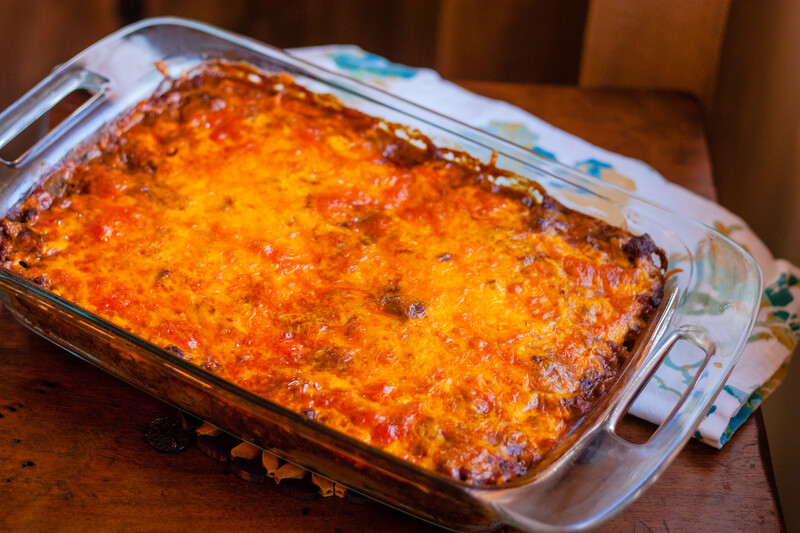 Now, they’re one of our kid’s favorite meals, especially Jackson, who is a Tex-Mex fanatic like me! 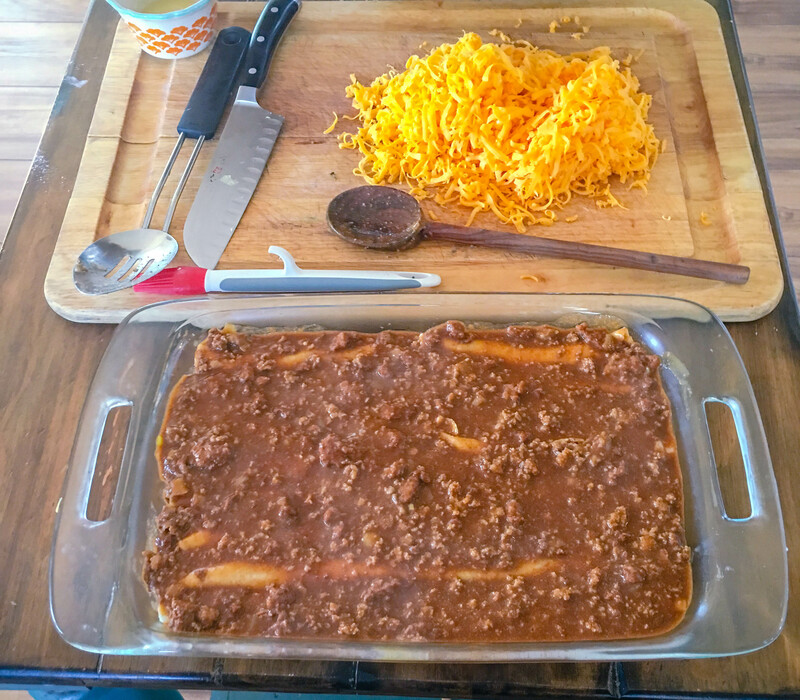 Mom took a short cut by using canned chili as the gravy, but I can tell you, it rivals the taqueria’s enchiladas, if not beats them in flavor. I hope you enjoy! After browning and seasoning the ground beef, heat about ¾ cup of oil in a shallow skillet over medium heat. Carefully dip each tortilla in oil to soften. 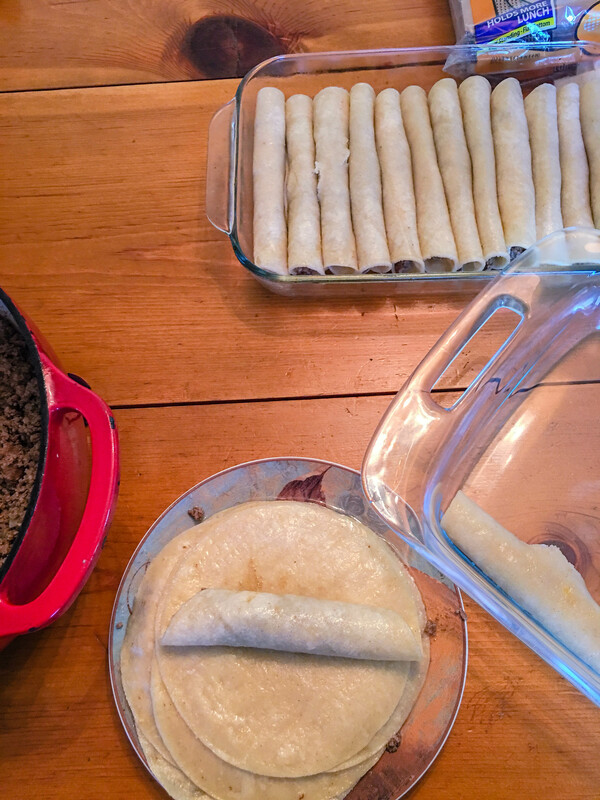 Use about 3 to 4 tablespoons of hamburger filling per tortilla; roll each one and place in rows in a large greased baking dish. Repeat procedure until all tortillas are filled. Mix remaining filling with the chili and heat until warmed through. 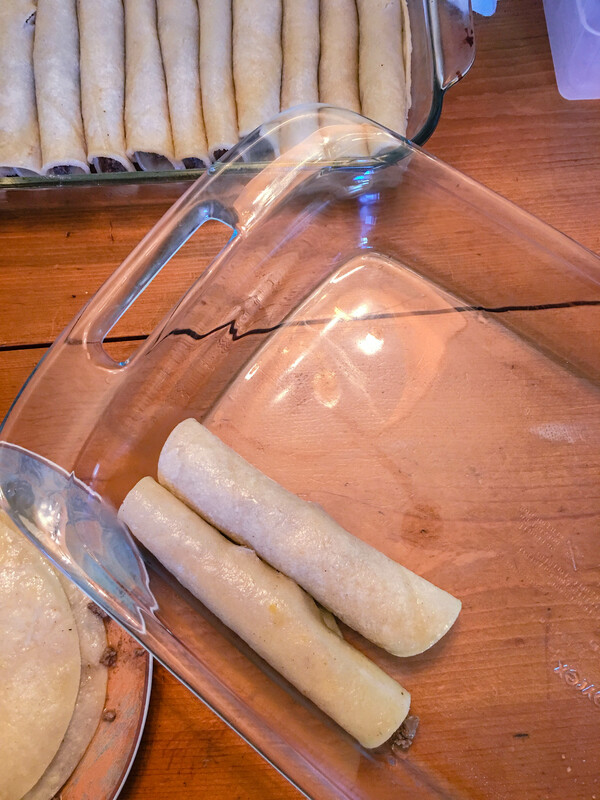 Pour over top of rolled enchiladas and top with cheese and remaining chopped onion. Brown hamburger in 2 tablespoons oil with 1 chopped onion until browned and onion is tender; drain. Stir in garlic and lightly saute. 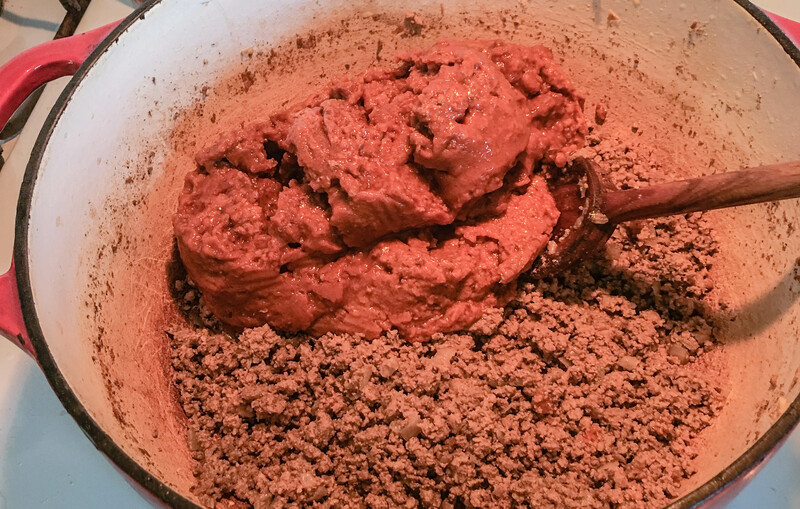 Add taco seasoning and house seasoning with 1 cup water. Simmer for 5 to 10 minutes or until most of water is absorbed and thickened. Heat about ¾ cup of oil in a shallow skillet over medium heat. Carefully dip each tortilla in oil to soften. 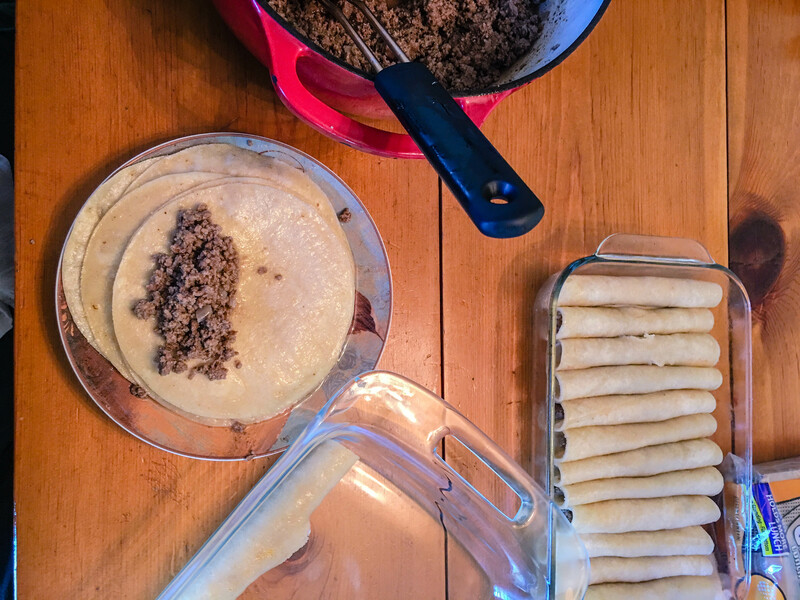 Use about 3 to 4 tablespoons of hamburger filling per tortilla; roll each one and place in rows in a large greased baking dish. Repeat procedure until all tortillas are filled. 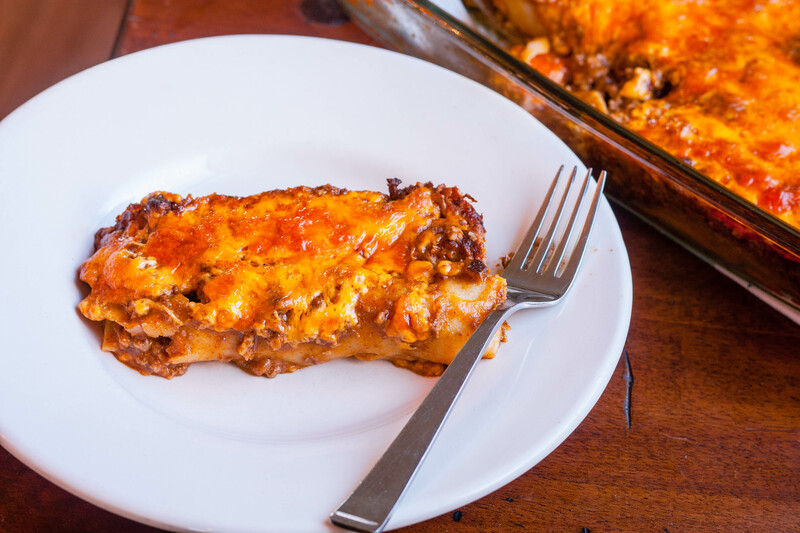 Pour over top of rolled enchiladas and top with cheese and remaining chopped onion and bake at 400 degrees for 30 minutes or until hot and bubbly.